To replace the daily rhythm of going to work, most of us old retirees need a lot of structured routine that we jealously guard. But a seasonal departure is welcome when my younger, still self-employed spouse gets some well earned—though unpaid–time off from work. We shared some meals with friends, watched some old British television shows, and reminded ourselves we are half-way through the dreary part of the year with no baseball. I hope your holidays were also rewarding. But just as Trump claimed to be on a “working vacation” at his West Palm Beach estate, I had a space heater going in my attic office before sunrise every morning to monitor the news so I would have something to review. As usual, there’s much worth noting on the many fronts of class war and accompanying ecological destruction. There was once a sort of “deep state” in Indonesia. In 1965 the Indonesian Communist Party was the biggest in any capitalist country. But that same year the army and vigilantes launched a months-long bloodbath killing hundreds of thousands of leftists, real or falsely accused. The triumphant junta enriched themselves by raiding the coffers of the state sector for more than twenty years. But corruption is not a viable long term strategy for development. As the Generals died off they were replaced by politicians and bureaucrats adhering to global “neoliberalism,” launching a deregulated market economy that soon became the biggest in Southeast Asia. In 1999, they were welcomed in to the G20 amalgam of old industrial powers along with developing ones. Underlying this spectacular growth was expansion of their traditional, environmentally destructive, extractive industries—hydrocarbons, minerals, metals and lumber from clear-cutting old growth forests. Tea and coffee supplemented mechanized sustenance agriculture. Peasants no longer needed in the fields became available for manufacturing offshored from high wage countries. 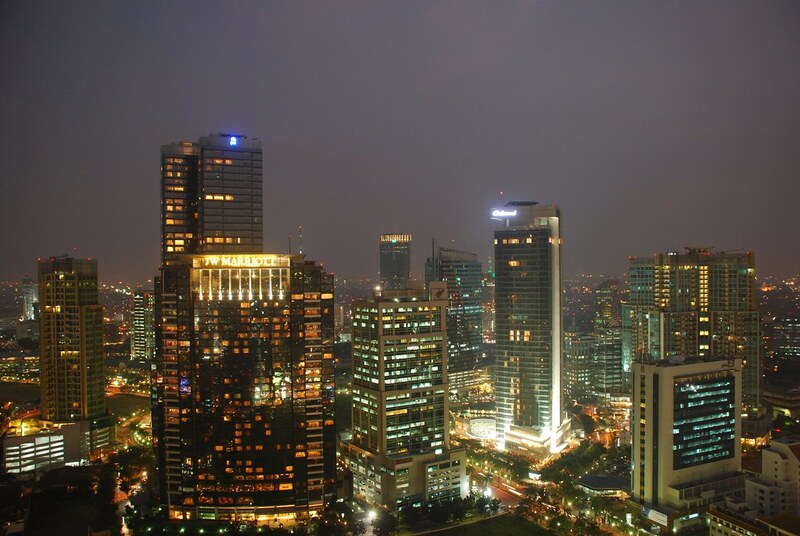 With no “job killing” regulations, cities grew exponentially—above all the capital of Jakarta. Today it is home to 30 million with a high-rise skyline rivaling New York City and a freeway system of 24/7 bumper-to-bumper traffic comparable to Los Angeles. A port city on an island, Jakarta has to be concerned about rising sea levels caused by global warming. This is exacerbated by the 15 rivers that flow through the city in to the sea. But rising water is not the only threat. Much like Greater Mexico City, with its population of 21 million housed on a squishy drained lake bed, Jakarta is also sinking. Experts say they have no more than ten years for taking far ranging remedial action—including moving millions of people—to avoid a catastrophe of biblical proportions. The link between human-caused global warming and Indonesia’s quandary has been proven by science. The culpability of capitalism on a world scale includes more than just ruling class addiction to fossil fuels. Urban sprawl’s numerous social as well as ecological ills prevalent in most countries is a powerful secondary infection of our biosphere. And all of these maladies are magnified by deregulation and austerity budgets such as those inflicted by the Trump administration. On its maiden run on brand new track Amtrak 501, carrying 85 passengers and crew, derailed on an overpass near Tacoma spilling on to Interstate 5. Three were killed, dozens injured, and property damage ran in the millions. The physics of the wreck were clear—the train entered a tight curve with a speed limit of 30 mph doing 78. Why that happened is still under investigation. The engineer and conductor in the front locomotive were hospitalized but it’s been established that they were not impaired by alcohol or drugs and hadn’t used their cell phones since boarding the train. Whether they were otherwise distracted, or there was some mechanical malfunction remains so far unknown. What is known for certain—this wreck, and at least several other major ones in recent years, could have been prevented. After a 1969 head-on collision of two Penn Central commuter trains in Connecticut that killed four and injured 43, the National Transportation Safety Board urged that all trains be equipped with what became known as Positive Train Control. PTC can detect if the train is exceeding speed limits, appears to be headed toward running through a red signal, or there is a danger of train separation. It automatically takes control to slow or stop the train. In 1969, rail carriers were about to unload their inter-city passenger service on newly created Amtrak and were preparing to invest billions in new technology. But this capital was not used for safety. Replacing “dark” track with automatic block signaling; written train orders from operators with radio communication; substituting the Federal Rear End Device for the iconic caboose; tracking shipments with bar codes and television cameras in the yards; and computerization of office work, led to a massive elimination of jobs in nearly all rail crafts. This was compounded by a merger mania that allowed abandonment of thousands of miles of track. Since all this enhanced carrier profits the bosses considered it money well spent–while safety measures are seen as cutting the bottom line. The NTSB can only recommend changes, not compel them. It was another 39 years before Congress acted to include a mandate for PTC in the Rail Safety Improvement Act of 2008. It gave the carriers until 2015 to install it system wide. But claiming poverty and other lame excuses little progress had been made by the deadline. A sympathetic Congress extended their time until the end of 2018. The new track in Washington was laid on the bed of an abandoned freight line. Engineers wanted to eliminate the curve where the train derailed but this was rejected as too costly. However, PTC capability was installed on the new track–and 501’s locomotive. But it was never activated or even tested. The carriers can not be trusted to protect the safety of the public, their passengers or their employees. It’s high time to revive the demand raised by the great Eugene V Debs more than a century ago—socialize the railroads and put rail workers in charge of their management. * A Super Deal—Amalgamated Transit Union 1005 represents 2500 bus drivers, light rail operators, technicians and mechanics in the Twin Cities. After months of stalling beyond contract expiration the Metropolitan Council finally made an offer to Local 1005 in November. It included a major take-away– increased hours for part-time drivers. Since it would delay promotions to full-time this was no favor for most part-timers and the deal was overwhelmingly rejected by the membership. The union then put the Council on notice—if no satisfactory agreement was in place by the first weekend in February they would strike. That just happens to be when the Super Bowl is scheduled to be played in Minneapolis attracting tens of thousands of out of town visitors. This seemed to have a salutary effect. The Council dropped their part-time concession demand, agreed to three annual 2.5 percent raises, and accepted union proposals for increased security measures to protect drivers from assaults and to establish adequate numbers of restroom facilities for drivers. It was approved by 82 percent of the ranks. * 655 Still Growing—United Food & Commercial Workers 655 claims to be the biggest local union in Missouri. They augmented their numbers with two organizing victories in December. Bon Apetit Food Services already had UFCW contracts at several St Louis locations and didn’t contest the union’s claim to represent 300 workers at the Washington University campus. They promptly negotiated a contract providing raises ranging from 11 to 14 percent over three years. 655’s other win was a much smaller unit but a breakthrough of sorts—a Dollar General store in suburban Jefferson City voted 2-1 to unionize. This was the first union victory at any of the company’s more than 14,000 stores in the U.S.
As we begin a new month as well as year I urge our Twin Cities readers to check out the events schedule at St Paul’s East Side Freedom Library. Tomorrow, January 3, I’ll resume posting of links on our companion Labor Advocate new blog. If you’re not already signed up you can get the Week In Review free of charge in one of the following ways. Our companion Labor Advocate news blog posts articles of interest to working people by 9AM Central, Monday-Friday.